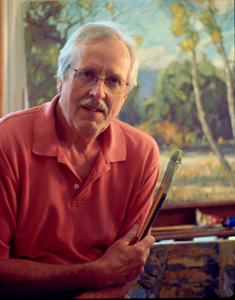 Karl Dempwolf is a contemporary California Plein-Air Painter who is known for his California Landscapes. HE spent his childhood growing up in the picturesque Bavarian countryside but at the age of fourteen he and his family immigrated to the US on the Steam ship America. Dempwolf received his BA from California State University Northridge CA, where he will always be recognized as that institution’s first All American Athlete. Dempwolf continued his art education by attending Art Center College of Design in Los Angeles, and the University of Southern California, getting his Masters degree in 1974. His paintings are in the permanent collections of large corporations, among them McGraw-Hill Publishers, and the National Park Foundation. Dempwolf’s newly published book ” A Painter’s Journey” is available on this web site.